Saying “no” can be a real challenge. When we’re asked to take on extra work, help a friend or do a favour for someone, it can cause a conflict. We might not actually want to do what we are being asked, but we don’t want to let down the person asking either. Don’t delay and beat around the bush by saying “maybe” or “I’ll think about it”. If you don’t want to do something, then politely say “no”. Delaying it will only make it harder to refuse at a later stage. If you know you can’t do it or don’t want to do it, then be honest. If you find saying “no” a struggle, then offering an alternative can be a good way to start practising. You’ll get more used to not just saying “yes” to everything. “That won’t be possible this week; can it wait until next week?”. If you’re finding it hard to say “no” outright, give a reason. Avoid lying to people but if you have a valid reason to say “no” then tell them why. If your reason is good enough for you, then they will just have to accept it. If you have been asked to do something and you find yourself faltering, remind yourself why you don’t want to do it. Will it take away time from something more important? Will it put too much pressure on you? Does it conflict with your values? Is it something you don’t feel comfortable with? 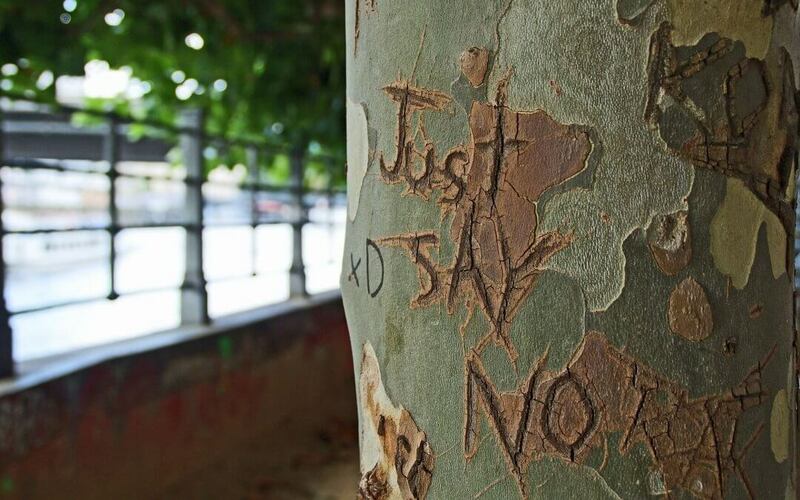 Reminding yourself why you want to say “no” will make it easier to actually say it. If you have agreed to do something in the past it doesn’t mean you have to do it every time. Changing a shift to accommodate someone, working overtime, rushing a job through, giving someone a lift somewhere, loaning someone money; doing it once doesn’t mean you can’t say “no” if you’re asked again. If you’ve said “no” then stick to your guns. Don’t be made to feel guilty or let someone manipulate you into backing down. You’ve said “no” for a reason and the person asking must respect your decision. Unfortunately, if you let yourself be a pushover, people will take advantage. The more often you say “no” to people, the easier it will become. Your time is valuable; use it doing more of the stuff that is important to you. There are occasions where just saying “no” isn’t enough. Is someone putting pressure on you to constantly do things that don’t make you happy? Are they making unrealistic demands? It could be time to walk away. You don’t have to end things in a negative way, but you can’t keep wasting precious time or energy on something that doesn’t align with your goals. When a friendship or romantic partnership breaks down and can’t be fixed, you need to admit it’s over and move on. If the bad times outnumber the good or you have lost respect for each other, then make the break. Don’t let the people around you hold you back. Leaving a job is difficult especially if you have made good friends at work. However, if your job doesn’t align with your goals, is putting a strain on your home life or makes you feel undervalued, then it’s time for a career change. You spend such a large percentage of time at work, it’s important you get some satisfaction or enjoyment. If you don’t, it can impact your overall wellbeing. If you are negotiating or renegotiating a business deal or arrangement and the terms don’t work for you or no longer work for you, then move on to another opportunity. If the other party is disrespectful, uncompromising or dishonest, then you’ll only regret agreeing on a contract. If you can’t agree on a deal or compromise that both parties are comfortable with then walk away. Unfortunately, some clients are difficult to work with. If a client is making too many demands on your time and has unrealistic expectations, then don’t work with them. You don’t have to take on every client or customer. If you can’t meet a client’s expectations, you’ll only damage your reputation. Politely explain that you can’t meet their requirements and suggest they find an alternative solution. Build better business relationships with clients, suppliers and employees by investing in the positive ones and walking away from the negative ones. You may have a great idea for a product but is it viable as a business in terms of the set-up cost versus return on investment. If there is no market for your product or service, then nobody will buy it. Even if there is a market, you have to know how to reach it. Don’t fall in love with bad ideas. Recognising when it’s time to walk away isn’t always easy. Coming to terms with the idea that a relationship is over or a business idea won’t work can be a huge blow to our confidence. When you actually make the break, it leads to a period of adjustment where you need to realign yourself and get back on track. As a life and business coach, I can help you to find the solutions that are right for you. If that means walking away, then I can support you by unlocking the skills and confidence you need to work through it in a positive way. If there are other issues that need exploring then we will look at those and identify what is the true source of your unhappiness. Even if you just need a little help building your confidence and being more assertive, then I’d love to hear from you. I can help you find your voice so you can say “no” more often. Contact me today to start reaching your full potential in life and business.